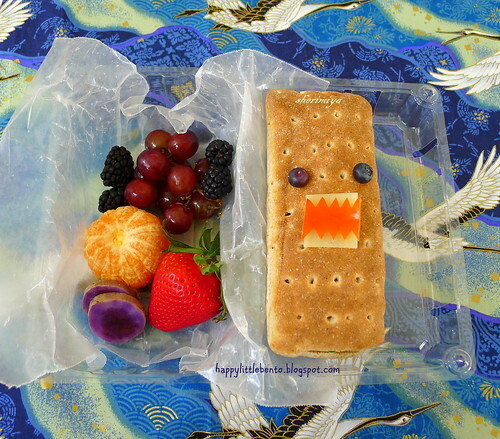 Domo Hot Dog Field Trip Bento, a photo by sherimiya ♥ on Flickr. Field trip day! 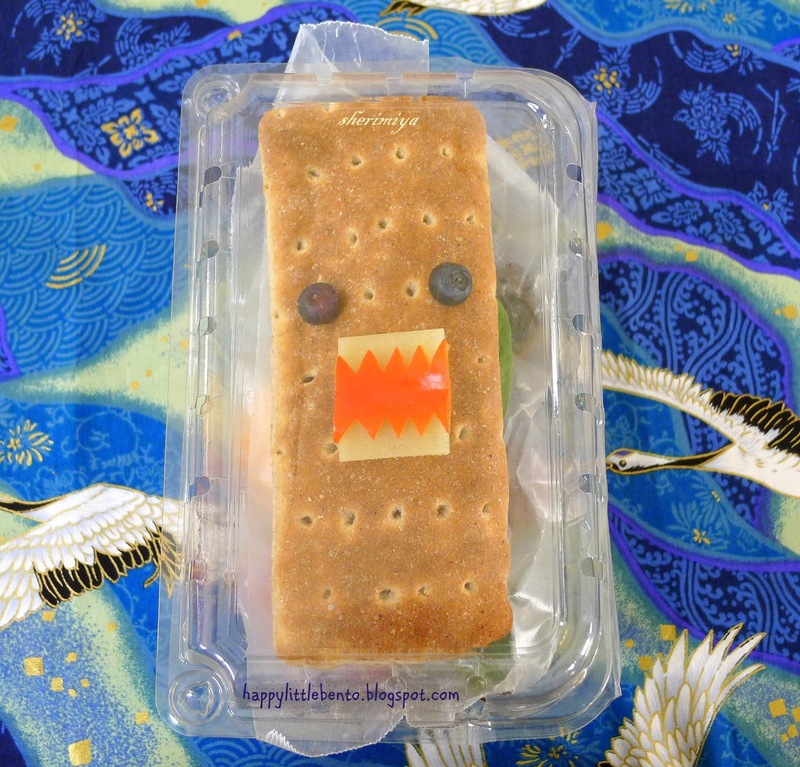 That means a finger-friendly bento packed in a disposable container for TinySprite to take to the zoo with her. The girl loves hot dogs, and I was all set to pack her dogs in rice or something, but then I saw these Sandwich Thins Hot Dog Buns. Or Hot Dog Sandwich Thins; I forgot exactly how they're marketed. All I know is that they were so cute I had to have them, and then I had to make a Domo face on top. Are you with me? Yes, there's a nitrite-free dog inside this "bun", which I decorated with blueberry eyes (stuck on with rice sticks), mozzarella teeth and a red pepper mouth. To simplify things, I used a cheese rectangle for the teeth and then just cut zigzags on two sides of a piece of red bell pepper. This way I can avoid cutting out eight separate triangle teeth. Am I a shortcutting genius or what? Inside this recycled strawberry box I also packed a small bunch of grapes, black- and strawberries, a tiny mandarin, and a couple pieces of Okinawan sweet potato. I wrapped everything in some wax paper before sealing the box closed. And look: Domo can see out the window. Yay! Aww, so cute! Thanks Keeley! i am 100% with you! i always love domo, especially your cute domo sandwich faces. i've not seen these thin hot dog buns in my store but will totally be on the look-out!! All right! Brown rectangles will never be the same. Thanks for your comment megan!